How times have changed! A handgun cartridge with the title of “OUTDOORSMAN” would historically be a revolver cartridge. However, these days many folks carry “street” or “home defense” pistols when they want to take a hike in the woods or go camping. 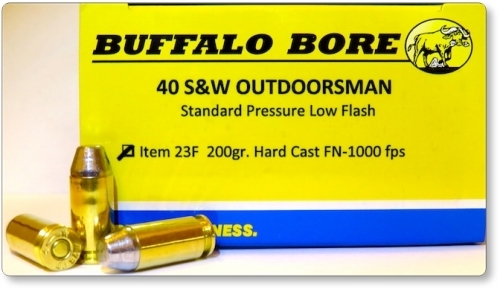 Due to customer requests, here is our new “Outdoorsman” 200gr. hard cast flat nosed 40 S&W standard pressure load. We’ve designed this deep penetrating load for use against wild animals where large bones such as a black bears shoulders or skull may need to be penetrated. This ammunition may also have tactical applications in situations where you may wish to defeat soft cover such as stick frame walls, car doors, windshields, sofas or whatever cover a bad guy may have jumped behind. Expect roughly 30 inches of straight-line penetration in flesh and bone. Today’s polymer framed, lightweight, reliable, accurate, affordable, high capacity pistols are a great tool for use in the woods if you run proper ammo for that purpose. My wife has three Glock 23’s that she uses for woods carry simply because they weigh no more than her three inches J frame steel 357 mag., but hold almost three times the ammo and don’t chew her hand up as much. Plus, properly tailored 40 S&W ammo, is as formidable as 357 mag. ammo. By using a hard cast bullet, we are able to gain velocity over jacketed bullets as hard cast alloy is much slicker than typical bullet jacket material. Hence more velocity can be developed with less pressure. If you are looking for a jacketed alternative to this load, see our Item 23C. You’ll note that this 200gr. bullet is moving as fast as most 180gr. 40 S&W jacketed bullets while staying within standard pressure limits. This is accomplished in part by using a hard cast bullet. This is a standard pressure cartridge which means it operates within SAMMI specifications for pressure. 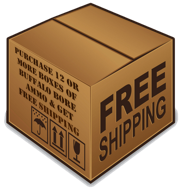 Therefore, it is safe for use in all (“all” means all) 40 S&W chambered pistols. Also, this bullet is NOT lead but is hard cast and it is OK for use in all Glock pistols. The nasty rumor that Glock advises against using hard cast bullets in their pistols is untrue. 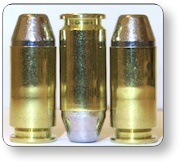 If you’ll go to our “Technical Articles” category (on our website) and read the articles, “Difference Between Lead & Hard Cast Bullets” and “Hard Cast Bullets in Polygonal Barrels”, you’ll gain much knowledge on the subject. We are utilizing a flash suppressed powder so the shooter will not be blinded by his/her gunfire. This matters, as most wildlife as well as the criminal element, become much more active in low light. As per usual, Buffalo Bore utilizes real-world over-the-counter firearms to develop our advertised velocity. We feel the duplicitous practice of using extra-long laboratory barrels that generate false high-velocity readings is misleading to the customer as he/she will never see these velocities duplicated from real world carry guns. All pistols showed good to excellent accuracy and all of them, except the tiny Kahr, cycled/functioned flawlessly. Micro 40’s, such as the Kahr PM40, have very little slide travel and they can be finicky cyclers. While my PM40 gave very high velocities and great accuracy, it failed to cycle reliably 100% of the time and would therefore not be a candidate for use with this load. This is not a reflection on the quality of the PM40, which is a very high-quality pistol. Nor does this mean the larger Kahr pistols would not reliably cycle this load. In fact, this does not mean that your INDIVIDUAL Kahr PM40 won’t cycle this ammo as ALL pistols are individuals and should be thoroughly tested with any ammo you intend to stake your life or the lives of others on. I recently harvested this 210 pound Georgia boar using my Glock 35 loaded with Buffalo Bore hard cast .40 cal bullets. The bullets performed well and the first shot was a headshot slightly off center that put the hog down in its tracks but I made a follow-up shot to finish it off to speed up the process of it expiring. I was about one inch off from center on my shot placement and I believe that is why it didn’t expire more quickly but it was clear that the first shot was a fatal shot in its own right. Thanks, Buffalo Bore for my first, but certainly not my last hog with a pistol.